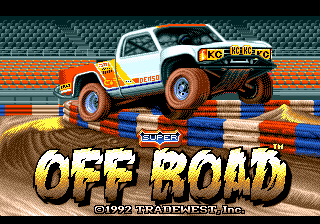 Super Off Road is a top-down racing game developed by The Leland Corporation and published for a variety of systems including the Sega Mega Drive, Sega Master System and Sega Game Gear; the Mega Drive version was licensed by Sega despite the ROM header saying otherwise. The first bunch released for the Sega Mega Drive is unlicensed, but later a licensed version was released. Yet the cartridge content is the same as the first bunch still making it unlicensed. 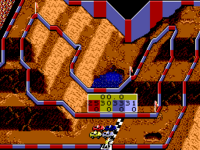 Super Off Road is a top-down racing game where the player (in red) competes against three computer-controlled opponents in off-road racing. The objective is to win the race over a small handful of laps, with prize money being dished out which can be used to purchase upgrades. One button accelerates while another gives the player a small nitro boost, as long as there are some in stock. Unlike other racers of its kind, Super Off Road puts an emphasis on physics, with the handling of vehicles being determined by the undulation and types of surface of the track, as well as collision with other players. Bonus nitro and money pickups also appear across the track during races. Success in the game is determined by how long you can keep winning. While initial stages let the player finish second, third or fourth, the requirements become stricter over time, eventually leading to a state where if you don't win, you will get an instant game over. To that end, money is not important outside of upgrades, nor does the game play like a traditional tournament, where players aim to win on points rather than the number of first place finishes. 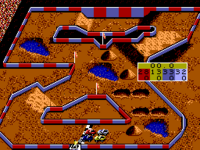 The Mega Drive, Master System and Game Gear versions of Super Off-Road each have a different selection of tracks. Some are shared between versions, while others are exlusive to certain platforms. To make things more confusing, often the names are swapped between systems, or are raced in the opposite direction - it essentially means that for the average player, each version is unique. 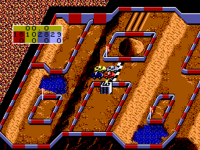 The arcade version only features eight tracks, and forces the player to revisit them several times (sometimes racing in the opposite direction) before all eight have been seen. 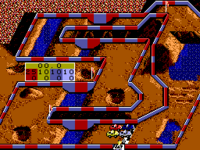 Only the Game Gear port mirrors the arcade game's structure - for the others, tracks are not repeated until all 16 (Mega Drive) or 12 (Master System) are seen. As the numbers suggest, this also means the Mega Drive and Master System have exclusive tracks. Main article: Super Off Road/Magazine articles.